Sweet deal for Koos buddy! Remember when the Town of Normal bought the former Sprague’s Service Station, 305 Pine St? Taxpayers paid off Terri Ryburn’s mortgage – $229,000. The taxpayers paid Terri $5,000. Taxpayers bought the lot next door for $24,000. The total so far is $406,000! Then add the $9,633 reported on the TIF documents. That brings the total to $415,633. Don’t forget Ryburn gets to live on the property for a whooping $120 per year. I thought the point of buying the property was to be a Route 66 roadside attraction. All the tourists would flock to Normal and then on to Bloomington. The Sales Tax revenue would fill city coffers! I wonder if Terry is relaxing in Florida? Arizona? Does the Town Council know their building is closed and not generating revenue? Do they know it’s always closed in January and February? The gift shop doesn’t even have any inventory! Posted in Koos, Local, Normal, Progressives, Taxes.Tagged Route 66 vistors, Sprague's Service Station, Terry Ryburn. I’ve never heard his name around here, interesting! Unbelievable. Pay attention Normal Citizens. Pay Attention. 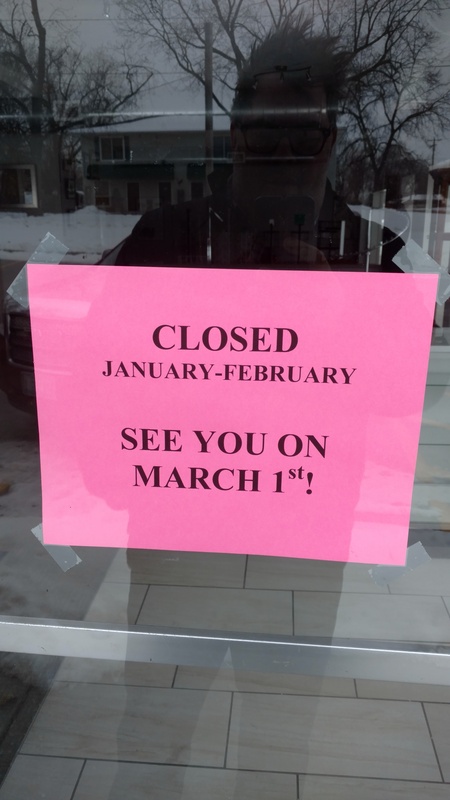 And don’t ya just love the cheery “See you on March 1st!” ? At least she could have added “Thanks suckers…uh, I mean taxpayers!” to her cute little sign. You ought to visit her FB page. She claims to be “left of liberal”….and posts liberal tantrums interspersed with “come visit my awesome museum” advertising. 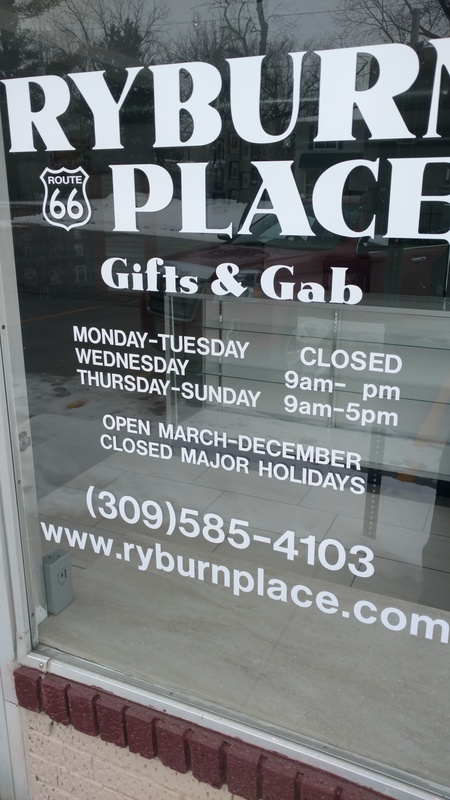 Won’t all those thousands and thousands of Rt 66 tourists be disappointed when they get to Ryburn’s and find it’s closed? Is it even near Rt 66? http://www.illinoisroute66.org/What-to-See/Details/articleId/3910 Oh and look, the coliseum and BCPA are Rt 66 attractions too! LOL! Diane,FYI, Terri Ryburn receives $3,500.31 in retirement benefits from ISU. Additionally a Benjamin Ryburn receives $7,555.63 monthly in retirement from ISU. I was NOT able to find if he is her deceased husband. As a widow she would receive half or what he was receiving before be passed away. I got this information from “open the books. Would you please let me know how to determine the name of a deceased spouse? Nothing was found on the findagrave website. Sometimes the memorials have the obit with those names. I limited my search to IL. If he was buried in another state it would be listed under another state. I did a U.S. wide search on Benjamin Ryburn and nothing turned up. Could be listed under Ben Ryburn or something else possibly. Then again if no one created a memorial it wouldn’t be on the website. See the other comments, a reader supplied more info. BEST display case museum I’ve EVER seen. Too bad I can only visit on Monday or Tuesday! WHAT A JOKE. Talking about KOOS getting suckered BIG TIME! Any comment Chris??? Normal council?? I don’t know when this photo was taken, but Terry always has tons of quality merchandise from local artists. Seems like a set up to me. Even when her display cases are full, who is going to buy all this crap from local artists? Places to sell it are what our local government considers economic development to be, but the truth is, they can’t survive without some type of government kickback. Ramona are you worried about your job maybe? I mean if the liberals on City Council get wind of what’s going on and they realize they aren’t going to get away with spending the citizen’s money on pet projects like you and Terry, you won’t have your job right? You also won’t have the connections with people who pretend to value your right? The fact you have no problem stealing from me, grants me permission to have no respect for you. If you are going to defend your friends, maybe Diane’s page isn’t the page to do it on. Try the Slantograph. Ramona, probably not a set-up. 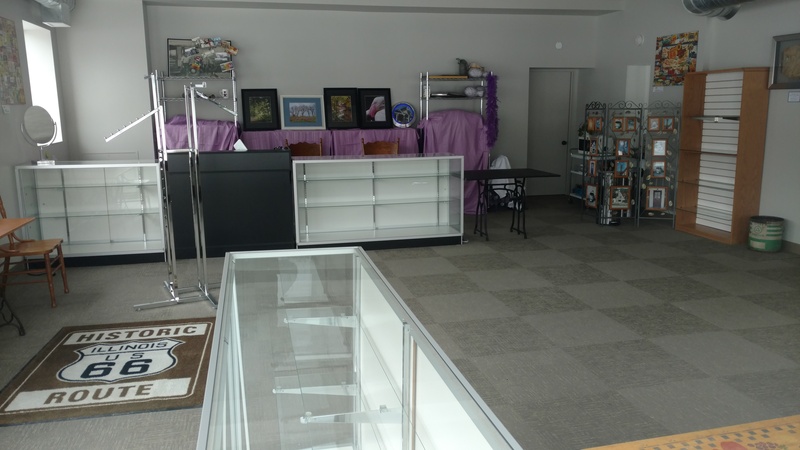 As a proprietor of a gift shop with lots of windows who has a sign up that they will be gone for 2 months, it is wise to pack up the inventory so as not to tempt a potential burglar searching for unique art collections. Angela, freedom of speech is allowed here. No need to make someone feel bad for having a difference of opinion. Yes it is. And in my opinion her doubting the validity of the pictures is an attempt to question Diane’s integrity. Her position is a drain on taxpayers and I did not say she couldn’t comment I just used my free speech to express my opinion of her and her position. And to inform her that this is not the Pantagraph and likely a less sympathetic crowd. Donna you seemed mightily concerned about my freedom to express myself lately. Is there a problem? I’m not here to make friends I’m here because I’m tired of being taken advantage of. I do not have a problem. I choose to interact with people in a different fashion. I am not looking for friends. I have all I need. Donna, you are and have interacted with me as though my expression does not live up to your standards. Just to be clear, I’m not trying to live up to your standards. I don’t work for the Government. I volunteer for my community and my community needs to see the ways in which our local government is stealing from them in a way that ignites a fire and creates change. You do what you do and please let me do what I do. I try not constantly criticize people on my side of the war. In fact I typically try to encourage, rather than silence them. But that’s just me. Angela, chill. I just don’t like it when anyone begins to attack someone on a blog because it takes away from the topic of the article and in some ways causes a loss of credibility. I see no sides to be “fighting” on. I apologize if I have made you feel criticized. Only with the government do you get a deal like this! Terry wins the prize for the biggest bilker of the town of Normal, and believe you me, there are plenty in line behind her. Question is when is Cheryl Gaines going to start driving the trolley between Terry’s place and Uptown? Her married name was hyphenated – possibly LaMonte or something like that. BTW, Gifts & Gab? Hmm, (left of) liberal claptrap indoctrination or polite, rational debate? IF it’s even an ART and CRAP gallery, these two towns are WAY over populated with such junk. Seems that every art major at ISU or IWU eats a box of crayons and craps it out, and it winds up on a wall or studio somewhere. That is NOT art. And IF these artists types ARE selling so much of this crap, then WHY don’t THEY use THEIR money to fund these projects? Food for thought… Want art? Look up Remington, Russell, Wood, Mucha, etc. THAT’S ART!! Lol, like B-N is some kind of art mecca region. Koos and Renner continuing to showing their stupidity. Betcha even their cronies laugh at them behind thier backs. It doesn’t matter, Townie. You see, artists and those involved/supporting the arts are liberals, therefore their opinions mean more than average independent-minded folks and most certainly conservatives to Koos and Renner.The “thriving” arts in Bloomington-Normal is a joke! It has not and never will be successful without being artificially propped up by government and taxpayer dollars. With or without government support, selling art and nicknacks does not grow an economy. Nick Africano got $500,000 from Normal taxpayers to raze two buildings at ISSCS. But they only razed one. I’ll bet he asks for another $500,000. The Koos supporters don’t care. They’ve never cared about taxpayers. They’ll make every excuse for him and the Ryburn’s hustle. Koos didn’t get suckered, he just hands out other people’s money without care. The Town of Normal confiscates money from productive businesses and citizens and then hands it out to their pals.